Following on from the retained list being announced on Monday when we saw Michael Blackwood, Jonny Harkness and Jon Munday leaving the club we now have the next one to leave. Gavin (Trigger) Hurren waved goodbye to the club today after turning down a new contract. Obviously it's not known what the terms of the contract were but they were not good enough to keep the popular defender at Aggborough for a third year. "There were one or two things we had left to talk about and in the end it was decided it was best for all parties if Gavin goes to play football elsewhere," Mark Yates said following the news. "I'd like to thank him for his efforts during his time with us, and we all wish him the best for his future career." Gavin joined the club before the start of the 2005 season from Nottm Forest after being released by them at the end of the previous season. 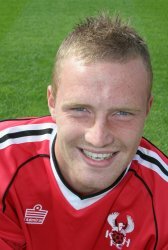 During his time at Aggborough he made 101 appearances for the side and had played in most positions on the pitch. It goes without saying that all of us at Harriers Online wish Gavin all the very best for the future. Two players that have got futures at the club signed their contracts today. Both Brian Smikle and Matthew Barnes-Homer (proudly sponsored by this website) have agreed to stay for a further season. It now leaves just four players; Iyseden Christie, Andy Ferrell, Simon Russell and Chris MacKenzie to sign their contracts with Christie's being the one that we will all be looking out for.